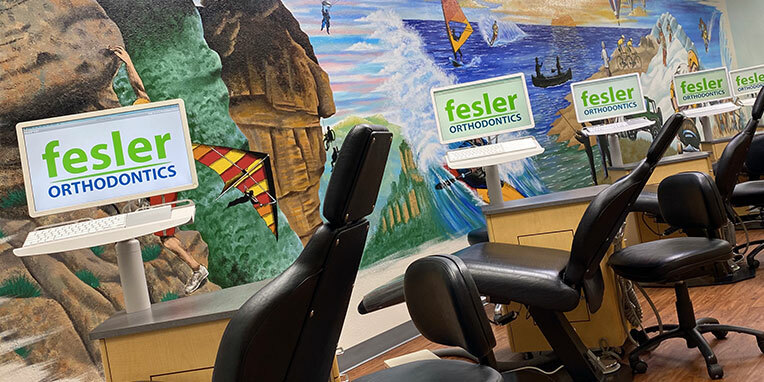 At Fesler Orthodontics, Dr. Michael Fesler, Dr. Charlene Sugay, and our team believe in offering our patients painless, effective orthodontic treatments, provided in a comfortable setting and delivered with a smile. We are patient-focused in all we do, which means we put your needs first. We want you to be actively engaged in your treatment, to help us make decisions about treatment options, and feel comfortable talking with us about any issues or concerns you might have. Our modern orthodontic practice is equipped with state-of-the-art technology and we use only proven treatment processes, while still providing compassionate care with the essential human touch. Dr. Fesler, Dr. Sugay, and our team know that locating the right orthodontic practice takes time. You need to find a practice that offers convenient hours, a comfortable atmosphere, professional care, and the treatment options you want. Schedule a complimentary consultation to come meet us, learn about our services, and talk about how we can help you achieve the smile of your dreams. Our Murphy, TX orthodontic office welcomes patients from Wylie, Sachse, and Richardson, as well as neighboring areas. Call and schedule a consultation for yourself or your child! We look forward to working with you to achieve exceptional oral health and a beautiful smile that will transform your life!